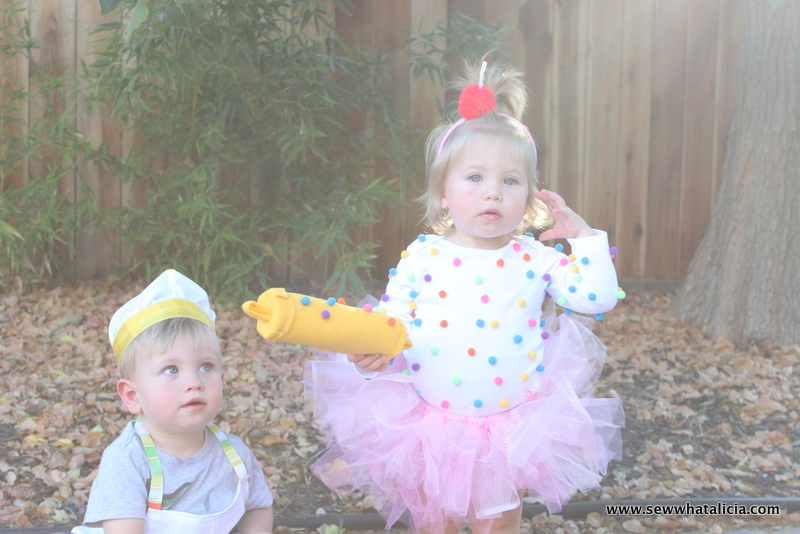 DIY Toddler Chef Costume Ideas - Sew What, Alicia? The other day I shared this Cupcake costume with you all! You may not have realized that the little lady was a twin! I had to throw something together for her brother right?? I decided to make him a chef costume and it turned out perfect! Here are a few chef costume ideas for you to make your own! 18-20″ and 10-20″ of 1.5″ grosgrain ribbon. The first step is to measure the circumference around your little one’s head. This little man has a head circumference of about 19″. I cut my ribbon to be 18″and then sewed each edge under 1/4″. Next attach the elastic to one of the edges of the ribbon and then to the other to make yourself a big circle, as you can see below. Now take the circle you just made and lay it out on one of your fat quarters. Draw a circle about 6″ out from the circle all the way around, obviously as you can see from my picture precision is not crucial!! Now cut 3″ in on one spot. Fold the sides in and sew them under (pictured below.) Pin the two sides of the slit to either side of the elastic, as I have done below. This should be on the wrong side of the ribbon, the inside. Now take the whole thing to your sewing machine. There are two options. You could skip the step where you pin the circle to the ribbon and sew a gather stitch around the bottom of the circle. Then pull the stitch until you have a piece that is the same measurement as the ribbon circle. OR you could be lazy like I am and just start sewing and gather as you go! This makes for a few more gathers in some areas and a few less in some. But I am completely and totally ok with that! Ta da you have a finished hat! It is really actually super simple!! The apron is also really simple! Cut a fat quarter to be about the same width as the front of your kiddo. You can trim the length too if a fat quarter is too long, I made this one go from the chest bone to knee. Fold the top two corners in and sew in place to create that apron shape. Then sew all the edges under by 1/4″ to keep from having raw edges. The last step is to add a ribbon connecting the top two corners, this will go over the head and keep the apron in place. Last add a ribbon on either side to tie around the back. Super quick and simple! The last of the chef costume ideas I have for you is to create a cute little rolling pin. I used one of the rectangles of felt that you can get at the craft store. Cut a few inches off the length. Then using hot glue roll it into a tube and hot glue in place. Stuff it with stuffing or use newspaper or scrap fabric, whatever you have lying around. Then hot glue the ends to the left over felt from when you trimmed it. Trim the edges and hot glue them down. I folded up some more felt into little tiny handles for the rolling pin and glued some of the sprinkles from the cupcake costume to finish the look. Now this guy is ready to hit the streets for some trick or treating! I bet you’ve never seen a cuter cupcake and baker!